The Irish National Stud in the rich, green heartlands of County Kildare is where many of the great legends of international horseracing have been born and bred since 1906. And while the big names like Arkle, Prince Palatine, l’Escargot and Dawn Run might trip off our tongues in a mixture of pride and pleasure for what is after all a national passion and pastime, how many of us would actually know one end (the important one) of a thoroughbred, from the other? Well, a visit to the Irish National Stud will certainly sort that one out for you! A far cry (or neigh even) from being a sterile, museum experience this is a working stud with mares being brought in daily to be covered (what a nice word for it?) by stallions like Invincible Spirit which can cost anything upwards of €60,000 a pop! For even more scandal, do try and take one of the tours as the insider tips and tales about the horses (and owners) are quite fascinating! With former champions such as Vintage Crop, who won the prestigious Melbourne Cup in 1993 being pointed out to you as they amble about in the sunny meadows obviously enjoying their well earned retirement. 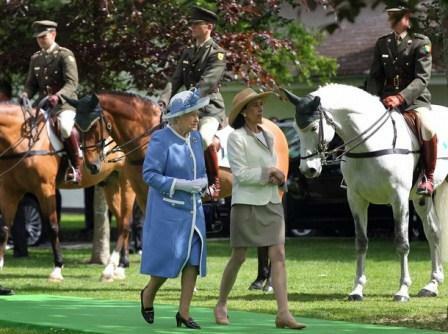 The Irish National Stud was honoured with a visit by her majesty Queen Elizabeth II in 2011 which was a great success with press photos being beamed around the world. An avid fan of horseracing herself she was blessed with fine weather and seemed to thoroughly enjoy her day out with the (other) thoroughbreds. As, I am sure you will as there is a lot to see and do, including the ultra modern Horse Museum where you can see the skeleton of the legendary Arkle and watch re-runs of those famous horseraces mentioned above. You can visit the Sun-Chariot yard and see the 5 star stables occupied by these equine princes, which overlook St Fiachra’s Garden, a reclaimed bog garden with meticulously re-created stone beehive cloisters similar to those on Skellig Michael off the coast of Kerry. 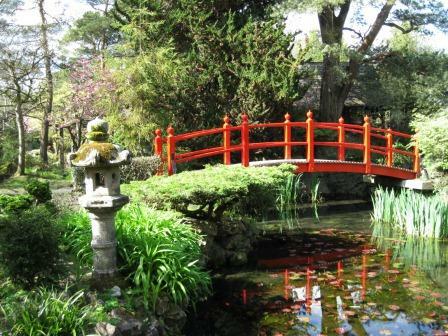 Not to be missed either, are the 100 year old Japanese Gardens at the Irish National Stud, created by Tassa Eida, his wife and two sons Kajii and Minoru (who had a very famous racehorse named after him) by the founder of the stud Colonel Hall-Walker. Begun in 1906 the gardens tell the age old, universal story of life from the cradle to the grave which took 4 years to build with an army of local labour and a ship load of bonsai and ornamental stone lanterns brought over especially from Japan. At its best in Spring with fresh green growth and soft pink cherry blossoms, it is nevertheless a pristine delight all year round, it is the most famous of all Japanese gardens in Europe. 10 Hidden Gems near the Irish National Stud. 1 Visit the Japanese Gardens, created by Tassa Eida, his wife and two sons Kajii and Minoru (who had a very famous racehorse named after him) by the founder of the stud Colonel Hall-Walker. Begun in 1906 the gardens tell the age old, universal story of life from the cradle to the grave which took 4 years to build with an army of local labour and a ship load of bonsai and ornamental stone lanterns brought over especially from Japan. Admission is included in your ticket above. 2 St Brigid’s Well, Tully, is a holy well dedicated to St Brigid who was a pagan Goddess long before she was revered as a Christian saint. The second patron saint of Ireland (after St Patrick) her feast day is the 1st of February. 3 Kildare Church, Kildare, St Brigid talked a High King of Ireland into granting her as much land as her cloak would cover to build an abbey here in the 5th century. Legend has it that when she laid out her cloak it spread out for miles from this very spot. 4 Kildare Shopping Outlet is a collection of designer shops selling cut price stock that is very popular with Irish and International visitors with a free courtesy bus to the train station in Kildare. 5 The Curragh is a very famous racing venue in Ireland where you can see racehorses been ridden out early each morning. Huge flocks of sheep account for it being nibbled to the perfection of a mown lawn. 6 Knockaulin Hillfort, Killcullen, not many people know about this place which is considered to be on a par with the Hill of Tara in terms of its ceremonial and strategic importance in Celtic times. 7 Rock of Dunamase take a left before Portlaoise if you are headed towards Cork, signposted the heath to explore another little known archeological gem considered to be the Acropolis of Ireland. 8 Robertstown is a lovely old forgotten about town on the Grand Canal which linked Dublin to the River Shannon in the hey day of barge passenger and cargo traffic before the invention of the steam engine. 9 Straffan Butterfly Farm learn the difference between a butterfly and a moth and why the Great Blue is extinct in Britain (open during the summer only. 10 Straffan Steam Museum and Lodgepark Walled Gardens a heady mix of steam power and flower power. For more about the Irish National Stud please click here.